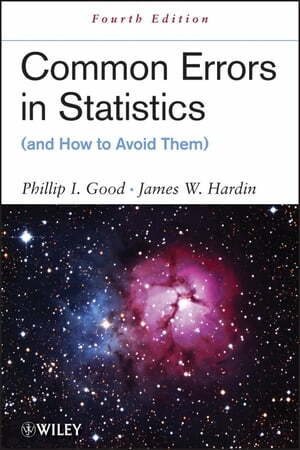 Collins Booksellers - Common Errors in Statistics (and How to Avoid Them) by Phillip I. Good & James W. Hardin, 9781118360118. Buy this book online. "A very engaging and valuable book for all who use statistics in any setting." "Addresses popular mistakes often made in data collection and provides an indispensable guide to accurate statistical analysis and reporting. The authors' emphasis on careful practice, combined with a focus on the development of solutions, reveals the true value of statistics when applied correctly in any area of research." Common Errors in Statistics (and How to Avoid Them), Fourth Edition provides a mathematically rigorous, yet readily accessible foundation in statistics for experienced readers as well as students learning to design and complete experiments, surveys, and clinical trials. The book concludes with a glossary that outlines key terms, and an extensive bibliography with several hundred citations directing readers to resources for further study.